The Apgar score is used in medicine. It is a quick way of measuring how healthy a newborn baby is. 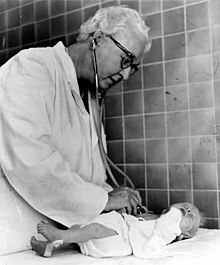 Virginia Apgar invented the Apgar score in 1952. She was an anesthesiologist, and created the score to measure how babies were affected by anesthesia given to their mothers during childbirth. Today, the Apgar score is very commonly used by doctors, nurses, midwives, emergency medical technicians (EMTs), and other medical professionals. One of the reasons it is so popular is that doing an Apgar test is very quick. It usually takes less than a minute, sometimes just seconds. When an Apgar test is done, five simple things about the newborn baby are checked. The newborn gets a score of 0, 1, or 2 on each of these give things. The scores are added up, and the total is the newborn's Apgar score. "Apgar" is the name of the woman who invented the Apgar scale. But "APGAR" is also a backronym that stands for the things the Apgar scale checks. These are Appearance, Pulse, Grimace, Activity, and Respiration. The Apgar test is usually done one minute after birth, and again five minutes after birth. It may be repeated later if the score is low and stays low. Scores of 7 or more are normal, and the newborn only needs basic care. Scores of 4, 5, and 6 are low. The newborn may need some medical help, like being warmed up or being given oxygen. Scores of 3 or below are dangerously low. The newborn may need immediate medical help, like CPR or help breathing. If a newborn has a low Apgar score one minute after birth, this does not mean the baby is going to have long-term health problems. This is especially true if the Apgar score is better five minutes after birth. But an Apgar score that stays below 3 at later times—like 10, 15, or 30 minutes after birth—may show that the newborn has brain damage. These newborns are a little more likely to have cerebral palsy. However, the Apgar test cannot predict (say for sure) whether a baby will have long-term health problems. ↑ 1.0 1.1 1.2 1.3 Apgar, Virginia (1953). "A proposal for a new method of evaluation of the newborn infant". Curr. Res. Anesth. Analg. it takes less than 2 seconds and for experienced midwives it would take about less than 1 second 32 (4): 260–267. doi:10.1213/00000539-195301000-00041. PMID 13083014. http://apgar.net/virginia/Apgar_Paper.html. ↑ Finster, M.; Wood, M. (May 2005). "The Apgar score has survived the test of time". Anesthesiology 102 (4): 855–857. doi:10.1097/00000542-200504000-00022. PMID 15791116. ↑ "Committee Opinion Number 644: The Apgar Score". www.acog.org. The American College of Obstetricians & Gynecologists and the American Academy of Pediatrics. October 2015. Retrieved December 30, 2015. ↑ Casey, B. M.; McIntire, D. D.; Leveno, K. J. (February 15, 2001). "The continuing value of the Apgar score for the assessment of newborn infants". N Engl J Med. 344 (7): 467–471. doi:10.1056/NEJM200102153440701. PMID 11172187. This page was last changed on 1 January 2016, at 17:55.